In climate change discussions, energy intensity is the amount of energy required to produce a dollars worth of GDP. While there are big differences in energy intensity around the world. Generally poor countries are more energy intensive than rich, and the US, Canada and Australia are more energy intensive than Europe and Japan. A recent graph from the Economist illustrates how energy intensities are falling and converging, unfortunately at a slower rate than economic growth, meaning that energy use, and hence CO2 emissions, continue to grow. Data Islandia, a local company, is trying to establish the island as a vault for a growing pile of data that firms must retain in order to comply with all kinds of regulations. It has a compelling pitch. With its cool climate, abundant geothermal energy and secure remoteness, Iceland appears to be a prime location for data archives.As often, however, truth is stranger than fiction. In a way, Data Islandia is erecting borders in the cloud: it intends to store European data according to European regulation and American bits according to American rules. What is more, to keep the data safe during transport, they are picked up with a data scooter (in essence a container filled with disk drives) and taken to Iceland by aeroplane as though fibre-optic links had never been invented. This illustrates the political tensions that will arise with the cloud. 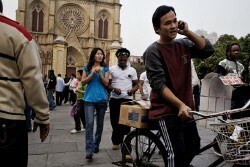 In one way it is the ultimate form of globalisation: vast virtualised computer systems and electronic services know no borders. Yet governments are likely to go to great lengths to avoid losing even more control. The BBC is planning to follow and report on the progress of a container around the world for a year. They have painted a container and bolted a GPS transmitter to allow is readers to follow its progress around the world on their map (as I write this the container full of whiskey in Scotland). The BBC named their project The Box after The Box: How the Shipping Container Made the World Smaller and the World Economy Bigger an interesting book on the history of containerization and its effect on globalization by Marc Levinson (here is a book review from Ethan Zuckerman and an essay by Witold Rybczynski). I read the book earlier this year and enjoyed it. I would have liked more economic history and statistics in the book, but its main problem was that people mocked me when I told them I was reading a book about containers. However, containers have become an essential part of global trade and of its rapid growth. 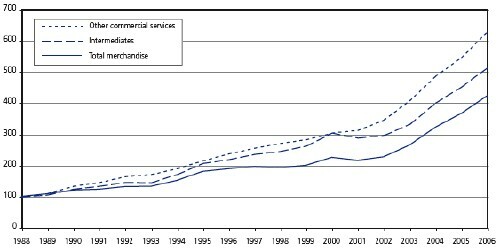 Trends in world trade of total merchandise, intermediate goods and other commercial services, from 1988-2006 (100=1988). From the WTO’s World Trade Report 2008. Below are some maps of parts of global trade. They give a bit of an idea of where such a container is likely to move between. Structure of world trade of between 28 OECD countries in 1992. The size of the nodes gives the volume of flows in dollars (imports and exports) for each country . The size of the links stands for the volume of trade between any two countries. Colors give the regional respectively memberships in different trade organisations: EC countries (yellow), EFTA countries (green), USA and Canada (blue), Japan (red), East Asian Countries (pink), Oceania (Australia , New Zealand) (black). From Max Planck Institute for the Study of Societies. 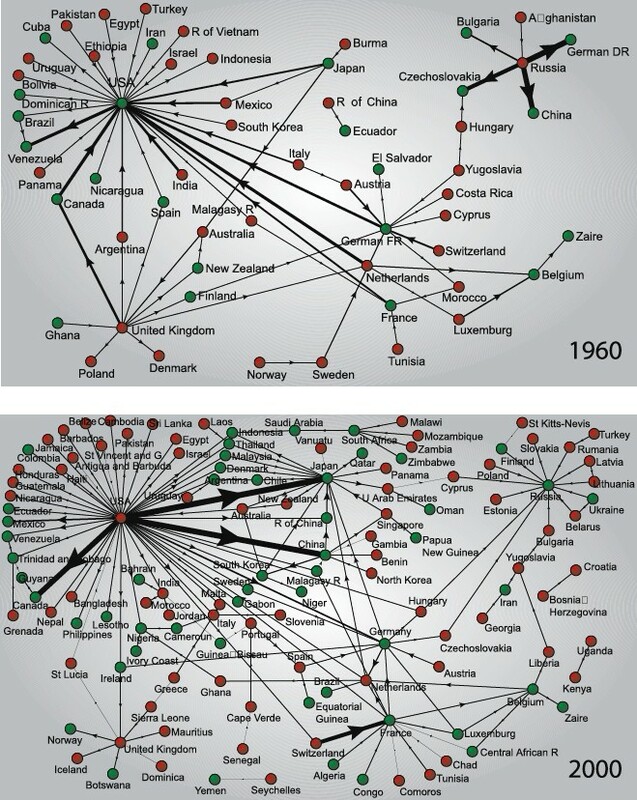 World trade imbalance web for the years 1960 and 2000. Directed network of merchandise trade imbalances between world countries. 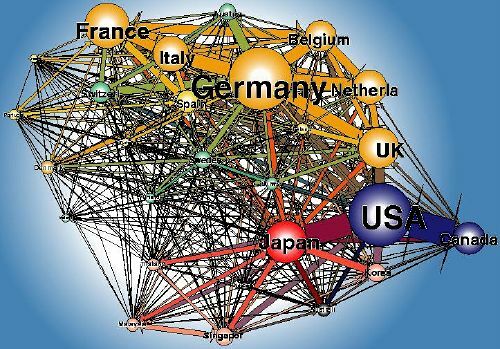 Each country appears as a node and the direction of the arrow follows that of the net flow of money. (Serrano et al 2007). The book – The Box – includes lots of interesting history of the container system, and how as a system it lead to innovations, efficiencies, and had many unintendend consequences. One example, is that it made many old ports obsolete which reshaping many city centres (over decades), but also the creation of new ports and the changes in container ships they triggered – caused ongoing shifts in global trade patterns. [Economic theory suggests] a country like China should export a wider range of products to a small country, like Ecuador, than it does to a big country, like the US. Why? Because Ecuador, being small, probably has fewer industries that are cost-competitive with Chinese exports. In fact, however, China seems to export a wider range of stuff to bigger economies. A possible explanation is the lumpiness of transport costs: there are more container ships heading from China to US ports than to Ecuadorian ports, so that it’s worth sending over a bigger range of stuff. It’s like the reason there are fewer food choices in supermarkets on St. Croix (where we spent our last vacation) than in New Jersey — there’s just one boat with groceries coming over every once in a while, so you can’t keep, um, arugula in stock. Reading the Box also makes it clear that while higher fuel prices will reshape trade patterns and probably boat designs, neither global trade patterns nor transportation costs will return to those of the 1960s or 1970s. This is due to huge improvements in logistics that have radically dropped the labour cost for shipping goods long distances, and this has also decreased fuel costs. The rapid expansion of skills in logistics is a hidden environmental efficiency of the moden world economy – in that it allows things to be moved around for less cost than earlier in history. However as occurs with most increases in efficiency, modern society undoes the environmental advantages of efficiency by using the cost saving to simply move more stuff for the same amount of money. Logistics makes at least parts of the world “flatter.” And the ease of making these connections appears to make it easier to spread tools and ideas as well as goods. The World Bank claims that countries with the most predictable, efficient, and best-run transportation routes and trade procedures are also the most likely to take advantage of technological advances, economic liberalization, and access to international markets. While countries with higher logistics costs are more likely to miss the opportunities of globalization. The World Bank ranks countries using a logistics performance index which measures the ease with which the country connects to the global economy. Singapore, Netherlands, and Germany are at the top as the most accessible; while Rwanada, East Timor, and Afghanistan are at the bottom of the rankings. Of course, novel solutions also produce novel problems. Discarded containers litter landscapes worldwide (finding uses for them has become a standard architecture project), container ports are centres of environmental and biotic pollution, and the ease of using containers is also useful for smuggling. And at least my impression from reading The Box, was that containerization has not finished trasnforming the world economy. P.S. Ethan Zuckerman also has a long post Mapping a connected world discussing containers and world trade. Huge investment funds have already poured hundreds of billions of dollars into booming financial markets for commodities like wheat, corn and soybeans. But a few big private investors are starting to make bolder and longer-term bets that the world’s need for food will greatly increase — by buying farmland, fertilizer, grain elevators and shipping equipment. Emergent is raising $450 million to $750 million to invest in farmland in sub-Saharan Africa, where it plans to consolidate small plots into more productive holdings and introduce better equipment. Emergent also plans to provide clinics and schools for local labor. One crop and a source of fuel for farming operations will be jatropha, an oil-seed plant useful for biofuels that is grown in sandy soil unsuitable for food production, Ms. Payne said. “We are getting strong response from institutional investors — pensions, insurance companies, endowments, some sovereign wealth funds,” she said. However, unlike the TechnoGarden scenario, this investment seems focussed on increasing yields of food and fuel, rather than producing multiple ecosystem services. Consequently, such investments attempts to increase yields by practicing intensive agriculture are likely to lead to negative impacts on other people and ecosystems using water, and potentially leading to local or regional ecological regime shifts (see our paper Gordon et al 2008). Also, many of these investments are not aimed at increasing agricultural yield on the ground, but hedging against inflation risk, and providing market power for large funds to leverage investments in other financial instruments, such as options, derivatives and other more complicated packages. This coupling of financial markets, to the already coupled food, fuel, and climate systems means that the systemic consequences of these investments are likely to be unexpected and novel.